The DPF75 is a combination 6-digit totalizer/batch controller and 5½ digit ratemeter with 2 relays. The user can set one relay for batch and the other for rate alarm. The totalizer and ratemeter display in the same engineering units: units per second, minute, or hour. The DPF75 can accept 2 inputs and separately scale them for "A - B" or "A + B". Either input A rate or net total can be displayed. The DPF76 is a 6-digit scalable totalizer/batch controller with 2 relays for 2-stage batch control. 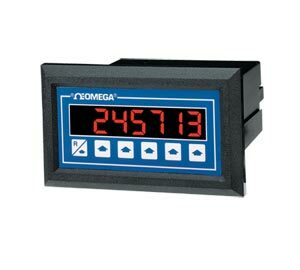 The DPF78 is a 4½ digit scalable ratemeter with 2 alarm relays. Nota: For 220 Vac power, add suffix “-220 Vac” to part number No charge. For RS-232 or RS-422 output, add suffix “-RS232” or “RS-422” and add $128 to price. Example: DPF75-RS232 is a ratemeter/batch controller with RS-232 output. Price: $406. For field-selectable 4-20 or 0-20 mA output, add suffix “-A” to part number, and add $131 to price. -A option is not available on models with RS232 or RS422 option. Discontinued - Six Digit Ratemeter or Totaliser.